Having previously used Comtrol’s products in their traction power substation, a public transportation company located on the West Coast of the United States looked to Comtrol when they began building an additional line for their light rail. 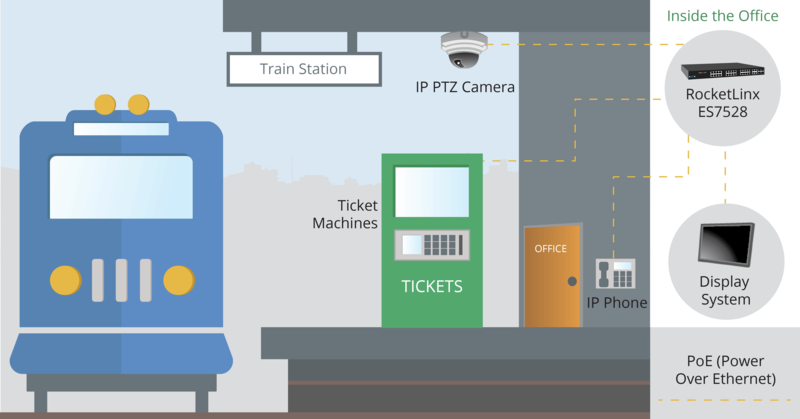 With the addition of this light rail line, the company chose to use Comtrol’s RocketLinx ES7528 to provide connectivity to the various IP cameras, IP phones, ticketing machines, and transit displays located along the platform. The RocketLinx is a PoE (Power over Ethernet) switch that provides the power to the IP cameras, IP phones, ticketing machines, and transit displays. In addition, it allows for network efficiency, wireless access points, easy placement, and efficiency and cost effectiveness in the installation process. The RocketLinx provides 24 10/100BASE-TX, 4 Gigabit uplink/4 SFP ports which support both 15.4W IEEE 802.3af and 30W high power IEEE 802.3at, including 2-event and LLDP classification. In addition, the RocketLinx has flexible bandwidth and long distance fiber data transmission via SFP transceivers. Built for industrial use, the RocketLinx ES7528 contains a rugged aluminum case which is superior for heat dispersal. In addition to properly functioning in temperatures ranging from -25°C to 65°C, the RocketLinx is able to withstand the vibrations expected at a light rail station. Together with the longevity, reliability, and temperature variations, the RocketLinx ES7528 provides the optimal solution for the light rail line.